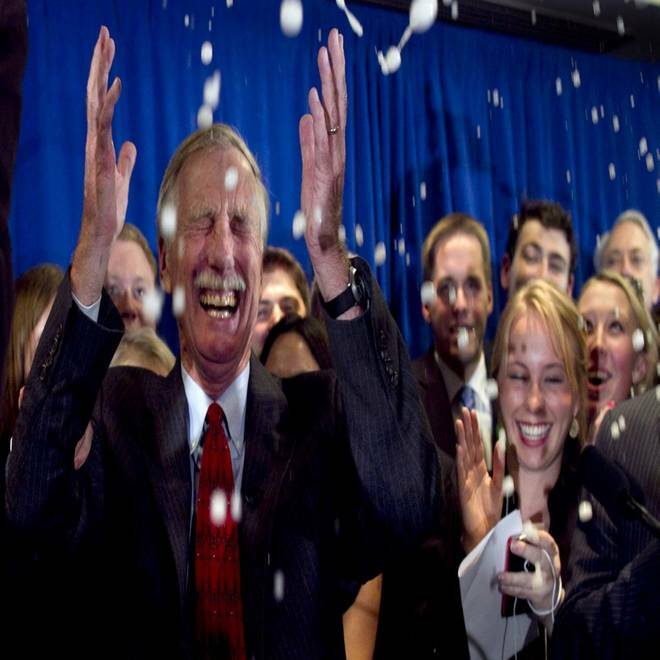 Independent Angus King celebrates under a splash of champagne after winning the Senate seat vacated by Olympia Snowe, R-Maine, Tuesday, Nov. 6, 2012, in Freeport, Maine. Angus King, the motorcycle-riding former two-term governor of Maine who promised to shake up Washington, is the projected winner of the U.S. Senate seat in Maine, NBC News reported on Tuesday. The seat, left vacant by the surprise retirement of three-term Republican Sen. Olympia Snowe, a moderate, is one of two captured by Independents. Vermont's Sen. Bernie Sanders, also has been projected as the winner in that state. King has said he will not decide which party he will caucus with in the Senate until he after he’s elected. National Democrats, however, have said they are confident King will caucus with them. King, a 68-year-old Harley-Davidson motorcycle rider, overcame an avalanche of negative television ads from out-of-state groups, the Portland Press Herald reported. Total spending on the race exceeded $10 million, the newspaper reported. About $4 million of that came from outside groups attacking King, with $3 million coming from King backers, including national Democratic groups, according to the Press Herald. National Democrats did not back their party’s nominee in Maine, state Sen. Cynthia Dill, a 47-year-old lawyer who some regarded as too partisan. In his first television ad, King, standing in front of a house, said, "Hi, if you're looking for someone who can get things done and shake up Washington, you've come to the right place," the National Journal reported. The Republican nominee was Maine Secretary of State Charlie Summers, 52, who made two unsuccessful bids for the House of Representatives. King served as governor from 1995 to 2003, and later started up a wind energy business.